Another nice thing about the Austin Wine Merchant is that they actually have some reasonably priced bottles, which is sometimes hard to find in collector-oriented stores! 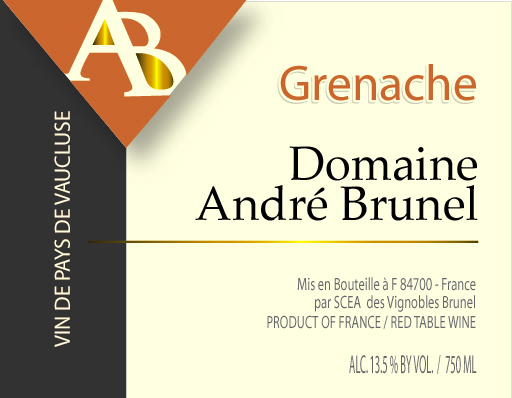 I picked up this Domaine Andre Brunel Grenache, a Vin de Pays de Vaucluse, for only $5.99! AWM is the Austin dealer for Robert Kacher Selections, meaning that they have lots and lots of wine from this premium French importer; Stephen Tanzer of International Wine Cellar says ” . . . the Robert Kacher Selections imprint on a label is a virtual guarantee of high quality wine.” I can’t tell you how important it is, when you’re exploring regions you don’t know backwards & forwards, to identify an importer that you trust. My big four for France are Kermit Lynch, Eric Solomon, Terry Thiese and Robert Kacher. Brilliant purple in color. Great big nose of mushroomy earth and sweet blueberry jam and syrup– more Garnacha than Grenache (mustache twirl), it seemed to me, though I couldn’t defend that opinion with any plausible argument. I was getting a lot of alcohol, too; at only 13% I would not have expected this heat. Might calm down with a little more cellaring? Palate was surprisingly tart, considering the syrupy nose. There was a good tannic grip on the insides of my cheeks, and mostly tart or barely-ripe blackberry/blueberry flavors with a good lingering finish, but it’s still very FRESH. Not complicated, but quite structured for a wine of this price category. I bought this last night and couldn’t wait to open it; I’ll be going back this week to buy a few more bottles. I tasted it alone and with the dinner that I made last night. Picadillo Estilo de Casa Scamp is basically ground beef browned with diced potato & onion, with one small can of tomato sauce in it. Add cumin, chili powder, cayenne and a dash or two of cinnamon. Once everything’s melded, toss in frozen petite peas and about a handful and a half (just a handful for you — I have freakishly small hands) of currants. Salt & pepper to taste. I serve it over rice and then also use it as burrito filling. Sorry, but I didn’t get a chance to snap a photo. Andre Brunel is best known for his Chateauneuf de Pape Les Cailloux, it seems, but he makes a few wines for The Rest Of Us, as well. His Cotes du Rhone is fairly well lauded, and I bet I’ll be telling you about it within a few months or so; I was eyeing that bottle at AWM too. Robert Parker has called him “one of the bright shining lights of Châteauneuf du Pape.” Brunel’s grandfather was a winemaker, as was his father, and the family has lived in the Rhone since the 1700s. This wine is 90% Grenache and 10% Carignan, tank fermented and aged (no oak here) to perserve freshness. A little more than half of the fruit is declassified Cotes du Rhone; that means that it was grown to be part of the Brunel Cotes du Rhone but wasn’t quite up to standard, so was bottled as something else instead. Cheapskate Alert: This is an excellent way to get good wine, cheap, from a winery with very high standards. Their high standards make their best offerings very expensive, but their declassified fruit can make wine that is better than the competition’s Good Stuff. If you live in Austin, I urge you to go down to the AWM and pick yourself up six bottles of this excellent value wine. On Saturday, after I buy my case… no, really, there’s plenty for everyone. Enjoy!